This week El Rey Del Sabor is introducing chapulines, or for those of us less familiar with this traditional food, grasshoppers. The grasshoppers were just imported from Mexico, where they are commonly eaten in many areas, including the cart owner’s hometown, Pueblo. The chapulines are available in various forms, with a $9 quesadilla advertised. 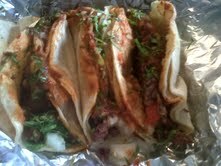 I opted to try the tacos, ordering two chapuline and one al pastor to balances the flavors out. I was impressed to see that the three tacos came to $9, and were stuffed with chapulines. The tacos were unlike anything I had ever eaten. When I ordered them I was filled with excitement, but when I actually saw the browned grasshoppers stuffed under a coating of hot sauce, cilantro and onions, the whole experience became much more real to me. However, knowing the health benefits of eating insects (more protein per gram than any other meat), coupled with the frightening thought that insects could become an ever more present item on our menus given our depletion of resources, I dived right in. Previous Entry:Just how Dangerous is Spicy Food?